Even though he fell short of reaching the NFL, former UCLA quarterback Kevin Craft doesn’t curse his past, but rather, embraces it. For him, football is football, whether it’s played at the Rose Bowl, or in France, or even in Japan. Craft, who played for a French team, Cougars de Saint-Ouen-l’Aumone, last year before landing in Japan to play for the IBM BigBlue in the nation’s corporate-oriented X League this spring, said in a recent interview that he just pays attention to what he is doing at the moment. “When I got here, I wasn’t focused on my talent level or stuff like that, because we are all who we are,” said Craft, a native of Escondido, California. “I’ve played with great players (in the United States) and played with average players in France. Craft’s route to Japan is an interesting story. Though he had never been to Japan before, he didn’t necessarily end up here by coincidence. Craft’s father, Tom, is a college football coach back in the States, and his two of his former players, Thom Kaumeyer (currently the defensive coordinator for the University of Hawaii) and David Powroznik (a former University of Southern California quarterback) coached for the Onward Oaks (predecessor of the Sagamihara Rise) in the X League during the mid-’90s. Tom Craft would sometimes come to Japan to hold football clinics for Japanese players alongside his two former players. Utilizing those connections, Daniel Lynds, another pupil of the elder Craft, also began coaching for Onward, and current IBM defensive coordinator Takashi Kubo, who worked with Lynds at Onward, asked his former colleague whether there were any good quarterbacks available. That’s when the younger Craft’s name came up. 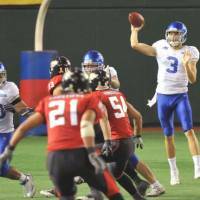 IBM head coach Shinzo Yamada said before the season that the quarterback position has had more impact on wins and losses in recent years, and he wanted to change his own team by acquiring a well-established American player to strengthen the position. Yamada, who played in NFL Europe and the XFL as a linebacker, added that Craft having joined the X League Central Division club, changed IBM’s on-field language to English, especially in regards to play calling. Craft is actually the offensive play caller. Craft hasn’t fallen short of Yamada’s high expectations. 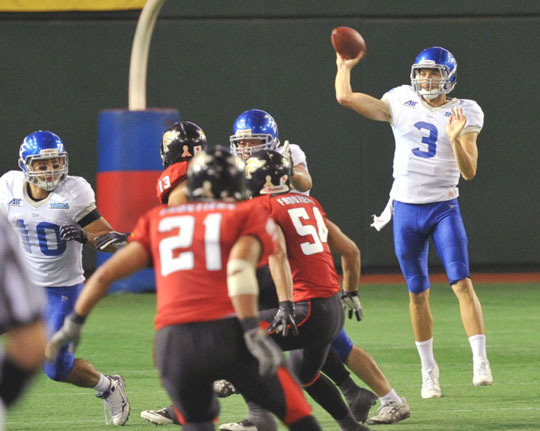 In fact, Craft, who is one of the first non-Japanese quarterbacks in the league alongside Oregon State University product Lyle Moevao of the Elecom Lobe Finies, gave Japanese fans a taste of what he could do in his X League debut. Craft threw 59 passes, and completed 49 of them, for 439 yards and a pair of touchdowns. He hit his first 17 passes to start the game, though IBM eventually lost 24-20 to the powerhouse Fujitsu Frontiers at Tokyo Dome. Craft, 26, bluntly said that “it just feels like a loss.” The BigBlue is 1-2 so far this the season. The 193-cm Craft has been the center of attention, and figuring out how to avoid giving up too many yards has always been a key focus of opposing defenses. The hard reality, meanwhile, is Craft couldn’t crack an NFL roster, despite possessing genuine ability. He was an NFL-caliber player coming out of UCLA, but the breaks didn’t go in his favor. Craft said he received many calls from NFL teams “all the way through the draft,” but none of them ended up signing him. “The (San Diego) Chargers, the (Chicago) Bears, the (Houston) Texans, the (Indianapolis) Colts, the (New Orleans) Saints and a lot of (other) teams, they were interested in me, they wanted to bring me in,” said Craft, who played at San Diego State University and Mt. San Antonio College before transferring to UCLA in 2008. In the NFL, or a major professional sports league in general, sometimes it’s not just a player’s capability but also other reasons — mostly business reasons — that are taken into consideration when building a roster. Craft referred to one quarterback who he thought wasn’t necessarily better than him but ended up being drafted by a NFL club, which would have an interest in acquiring Craft as an undrafted free agent, but didn’t, telling him it didn’t want to hurt the drafted quarterback’s confidence and so on. Craft said that he wasn’t upset about what happened, because otherwise he wouldn’t have gotten the chance to coach with his father, who he said was his biggest influence in football, at Riverside Community College, or travel to France and Japan. “I would’ve have gotten a chance to come over here to do the whole experience in Japan,” Craft said.